Following my brioche preparations, and Unravel yarn purchase, I've finally cast on Stephen West's Askews Me Shawl. 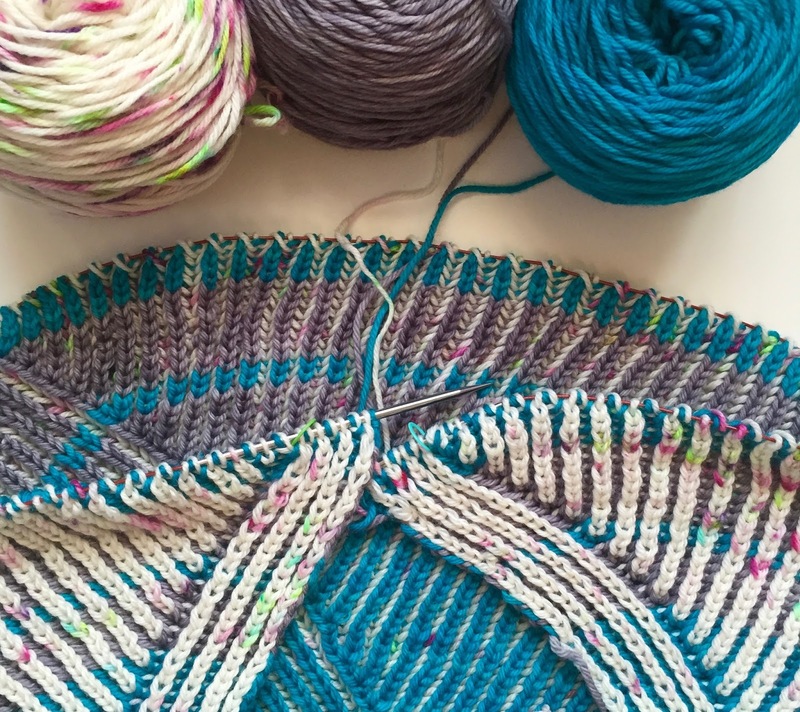 This shawl is the very reason I decided to learn brioche, and the project is all about the end product - I can't wait to wear it. 1. Until you know how to do it, it looks like it will be hard. 2. Once you can do it, it's pretty easy... but you still have to be vigilant to avoid accidents. Once my instructor taught me a simple technique, parking became quite easy*. Of course, you still need to be cautious and look around while you're moving. It's the same with brioche knitting - precisely because it's 'easy' it's possible to become complacent. A few times I have been knitting without looking and the realised that I hadn't caught a whole stitch (remedied by dropping the stitches down and correcting with a crochet hook, but still...) or had done the wrong thing to the stitch. 3. When you regularly park in the same car park, you might forget the precise spot you're in. Do you ever get back to the spot you think you parked in and realise that was where you parked yesterday? Then you have to figure out exactly where you left your car (usually by wandering around while pressing the remote, until you hear the bleep or see the lights flash). Brioche (when knit-flat with two colours) is very repetitive. 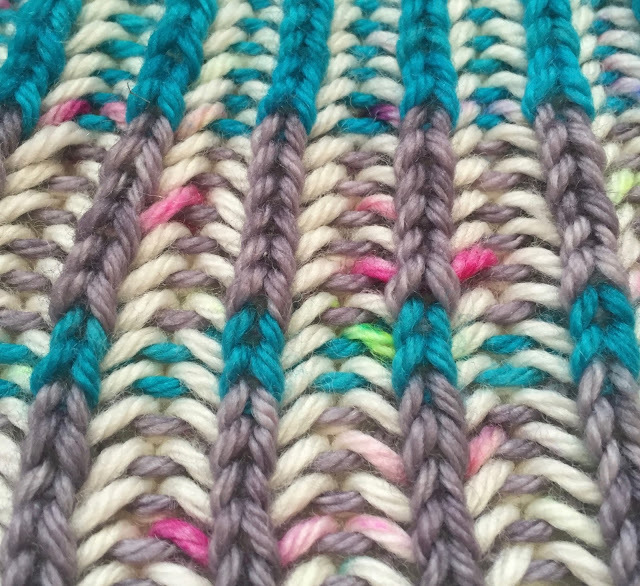 Each row of this project is worked twice before turning - once with the dark yarn, and then again with the light yarn. The first pass is a knit (brk) row and other is purl (brp) but both on the same side of the work. It is quite easy to do the wrong one, as I discovered last night. Still tired from my weekend away, I was knitting in a trance while watching TV. When I looked down it was to find around 10 cm of the wrong stitch, several rows previously. (I'd put it down and picked it up again without really paying attention to which side of the work I was on.) I decided that it wasn't worth fixing - it's probably not something 'non-knitters' would spot, and fellow knitters tell me that it's like the deliberate mistake in Amish knitting. I can live with that. *Disclaimer: This does not apply to parking a PT Cruiser - to park a PT Cruiser you aim for the space next to the one you want to end up in, and then hope for the best. After a few years, it becomes quite natural but then you can never park any other car properly ever again! I'm so glad that you're enjoying this journey too - you should definitely give it a go as its really not difficult provided you remember the things above! You are my doppleganger!!! I have back at home a 1973 Fiat500!! She's yellow and her name is Primrose - teeny tiny and she lives with my brother whilst we are out here!! I'll tag you in a photo of her - she's gorgeous!!! I had to LOL at parking the PT Cruiser. We used to have one; now we have a Prius and for the first year or so I had to remind the husband he did not have to swing left before turning right anymore!! Your brioche is just beautiful! !